Winter is the weather when cool breezes and low temperatures surround us. It is the time of the year when fireplaces and bon-fires become alive. The blazing fire and crackling flickers allures one towards itself. This all fun and luxury of warmth is all thanks to the pieces and logs of woods which are the basic raw material. Searching, chopping and bringing wood to its destination is a tedious task; which becomes more difficult in winters. As in winters the roads and paths are not friendly for such a journey and searching and cutting even becomes difficult due to the cold weather. Therefore one should act proactively and depending on the weather and ones need stack ample amount of wood beforehand. The first step is to find the right type of fire wood. Once found the next step is chopping. For piling purpose wood pieces should be cut in triangle shape. In this way the pieces can be piled on top of each other with ease taking less space. It also reduces the chances of stacks rolling off, creating a mess and injuring someone. An ideal length of wood logs should be between twelve to twenty inches long. Use a wheelbarrow to bring it to tour place. While chopping; remember to chop some small pieces which shall be required to start a fire. These pieces can be bundled in a corner and used to blaze up the fire every time. In order to increase the life of wood and safe it from natural decay it is preferable to stack it in racks little higher than the ground level. This is because direct contact with the ground may result in the wood getting rotted; chances of growth of algae, fungi and other such mosses increases. Direct contact with ground also increases the chances of the log becoming home to insects and animals; which will make them less efficient for fire purpose. Therefore try to stack them a little higher than ground. The stacked piles need support on both the end to remain intact for the whole for the purpose any heavy thing can be placed on each end. Tailor made steel barricades and stoppers are available in the market for this purpose. Completely shutting off from natural elements like sun and air will also decrease the woods life. Ensure that the wood receive air and sun. The best practice is that the piles are stacked in the manner where sunlight reaches through the sides and air from the front. This will help in keeping the wood dry for the coming season. 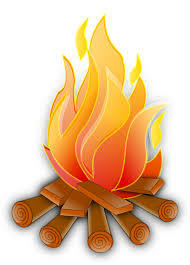 While stacking the wood makes it convenient for use in the coming season, it is dangerous in case a fire erupts as wood catches the fire easily and the whole building can blaze up. Therefore, if possible try to store the wood away from the main building to avoid any big accident. Also take extreme care near the stack area and try to regularly check on the store. Okay so we love outside work and DIY projects in and around the yard. But, it’s that time of year when you need think about the inside of the home. Yes, fall is here, and Winter is rapidly approaching. 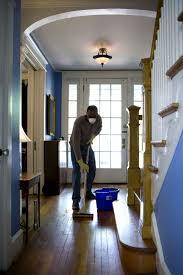 We know Spring cleaning is a popular to-do but what about fall cleaning? As we prepare for the rain, snow, ice and whatever else old father winter in has store this year make sure your dwelling is comfortable. This goes for routine maintenance items such as changing the air filter in your furnace to closing the vents in your foundation. Also, chores like cleaning the fireplace and chimney. Getting the carpets cleaned to eliminate all the pollen form the summer before. We like to spray spider barrier around our property every fall and late spring early summer. We started doing this over the last couple years and can’t recommend it enough. Typically, we see a ton of spiders come inside when the temperatures drop. Since we’ve started using a barrier product we haven’t seen a single creepy crawler inside. Another thing my wife absolutely must do is clean the windows inside and out. A college friend of hers runs a Boise window cleaning company and let her in a little winter trick great for the DIY’s. Cleaning the windows is a chore especially if they are on an upper floor, so don’t risk your safety and hire a professional window cleaner if needed. They can also do this and will likely have a similar product. After you get your windows as clean as you want, which my wife works for hours on them until they sparkle. Once they are clean apply some rainX product to the outside windows, this will help them repel the weather throughout the winter. It’s a great little trick, the windows might still attract a little dust or dirt but when the rain hits it tends to come right off and the rain dries without streaks. Another thing that’s on our Fall cleaning list is the stove and oven. I know it’s a probably one of my most disliked chores, but it has to happen. Typically, during the summer, we BBQ 75 percent of our meals. But in the winter, we just can’t. So, we make sure our oven and stove are clean and ready for the abuse over the winter. I personally must make sure my garage is in order and there is room to work out and do projects. Throughout the summer we tend to fill our garage with rafts, bikes, and miscellaneous sporting and outdoor gear. Its time most or all of that gets packed up and put away. With winter around the corner, my workouts move indoors, and this is “my” number one, must do. As you prepare to hibernate make sure your “cave” is prepared also! There are some tricks or rather processes a professional lawn care company knows which make yards look fantastic! Don’t get me wrong they are professionals and typically care for the work they do. However, it’s not rocket science, it’s just a matter of knowing how to do it, when to do it and with what equipment. Don’t worry you won’t own a truck and trailer full of tools after deciding to take on your lawn care. Rather a few good multi-purpose essentials, a good pair of gloves and the knowledge to complete the job. Through a series of posts, we will cover the seasonal aspects what you should do for proper lawn care to ensure a healthy lawn year-round. As well as your shrubs and trees and how to keep them looking their best. A number of following posts will cover individual aspects for general tasks such as mowing your lawn or trimming your shrubs and trees, promoting an overall healthy landscape. We look forward to checking in with you again shortly with our Fall Yard Care Guide.